After wet material is put into the hopper, the stove(boiler) generates hot wind. Then wet sawdust is sucked into the pipes by the exhaust blower(fan) , flowing and go though the curving pipes and buffer(drying chamber) of dryer, thus the wet sawdust is dried, and the dried sawdust is discharged from the outlet with air lock. 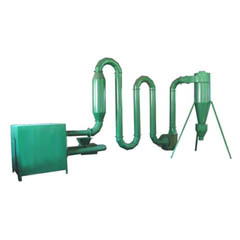 This type of dryer is suitable for drying heat sensitive material which is light and small like sawdust, rice shell, milled stalks etc. General Wet material can be dried in a few minutes. Compared with rotary dryer, it has the advantages of low energy comsumption, low cost. The feeding of fuel for boiler is by manual. The fuel can be wood waste like tree branch, tree trimmings, wood chips, coal or any waste that can burn (But Gas or Oil is impossible for the boiler now). With a moisture reducing rate of 8-12%, the dryer GC-DL is equipped with a hot air boiler, which is suitable for drying raw materials with moisture content less than 20-25%. 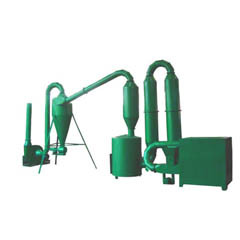 Raw materials need to be dried if their moisture content is higher than mentioned above, and two or three time of dry up is necessary to achieve the demanded moisture content for wood briquette maker. The Moisture reducing rate of the dryer GC-DL-4, GC-DL-5.5, GC-DL-7.5 is 8-12%. This dryer is equipped with one hot air boiler, it is suitable for drying raw material with moisture content less than 20-25%. If the moisture content of the raw material is higher than that, it will need several times of drying to achieve the requested moisture content for briquetting. Twin boiler dryer is a newly developed dryer with two hot air boilers, it is suitable for drying raw material with moisture content of 20% -50%, it can reduce moisture from 20%-50% to 8-12% only one passage or one time.